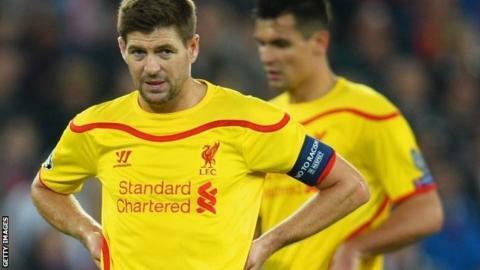 Liverpool captain Steven Gerrard questioned his team-mates' desire and determination after their 1-0 Champions League defeat at Basel. "They wanted it more, which is very disappointing," he told Sky Sports. "We didn't deserve anything. We were too soft all over the pitch and conceding again from a set piece isn't good enough." Liverpool slipped to third in Group B and play holders Real Madrid in their next two games in the competition. Marco Streller scored the winner in the 52nd minute, sweeping home from close range after Liverpool defender Martin Skrtel headed the ball against fellow centre-back Dejan Lovren and goalkeeper Simon Mignolet parried the ball into the Basel striker's path. Liverpool were mainly limited to long-range efforts and set-pieces and struggled to create clear-cut chances. Manager Brendan Rodgers was also critical of a defence that also conceded goals from set-pieces in recent Premier League defeats by Aston Villa and West Ham. "Set-piece defending is something we continue to talk about, look at and analyse. But you have to do it on the field," he said. "The key to defending is your first contact with the ball and we continually don't do that enough." Liverpool striker Mario Balotelli endured another frustrating evening, managing one shot on target. The Italian, signed from AC Milan for £16m, has scored one goal in seven games for his new club. "He worked hard but needs to do more," Rodgers said of the 24-year-old. "He will be judged on what he creates and what he scores and he didn't score. The boy is trying; he is working hard." Rodgers also revealed that he reminded some of his players to applaud the travelling contingent of Liverpool fans at St Jakob Park.